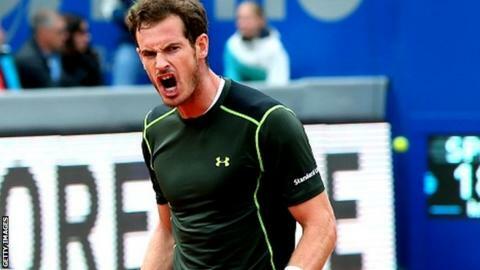 Andy Murray won two matches within a matter of hours to reach his first clay-court final at the Munich Open. After rain on Friday, the top seed saw off Lukas Rosol 4-6 6-3 6-2 and returned less than three hours later to beat Roberto Bautista Agut 6-4 6-4. Murray exchanged angry words with Rosol after the pair bumped into each other at a changeover, with Murray later describing it as "just silly". The Briton will play German fifth seed Philipp Kohlschreiber in the final. Murray's day began at 10:00 local time with a testing encounter against Czech Rosol, who reeled off five games in a row to take the first set. Murray had lost all five of his previous clay-court semi-finals - four of them against Rafael Nadal and the other against Novak Djokovic. Tempers frayed after the players made contact at the net between games, with Murray going on to tell Rosol across the court: "No-one likes you on the tour, everyone hates you." Murray, who is travelling with coach Jonas Bjorkman this week for the first time, responded positively to take control of the match, breaking five times on his way to victory. "He walked straight into me for no reason," Murray explained later. "If I walked into someone for no reason I would say sorry. But he did it and then ran to the other end. "His fitness trainer later apologised. I should not have said what I did but if someone does that and you don't respond, you let them dictate how the match goes. He added: "I have had no problems with him before, but a lot of players say he does those sort of things. It's just silly. It gives more motivation and I told him that in the locker room." Third seed Bautista Agut beat Victor Estrella Burgos of the Dominican Republic 4-6 6-0 6-0, but the Spaniard could not build on a solid start against Murray in their semi-final. The Briton turned around a 3-0 deficit with back-to-back breaks and made the decisive move with a third break at the start of the second set. Murray later played his third match of the day when he and Dutchman Jean-Julien Rojer lost 6-3 6-2 to top seeds Alexander Peya and Bruno Soares in the doubles semi-finals. Kohlschreiber had earlier needed one hour and 37 minutes to see off Austrian qualifier Gerald Melzer 2-6 6-1 6-4 in the second singles semi-final.